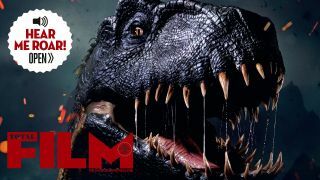 Can you hunt down Total Film magazine's limited edition ROARING Jurassic World: Fallen Kingdom cover? Yep, in selected Sainsbury’s stores throughout the UK, there’s an exclusive, extremely limited-edition box featuring new dino the Indoraptor… and it roars! Open the front cover to hear the Indo roar and stomp in all its glory. And that’s not all. The Sainsbury’s-exclusive roaring box comes with a Jurassic World employee pass, in addition to the 36-page Jurassic Park special, the Fallen Kingdom art card, and the How It Works: Dinosaurs ebook that come with the newsstand version of Total Film. Inside the issue, there are exclusive interviews with franchise regulars Chris Pratt, Bryce Dallas Howard, Jeff Goldblum, Colin Trevorrow, and incoming director J.A. Bayona. Basically, if you’re a Jurassic fan, you won’t want to miss it, and the issue also includes stories on Solo: A Star Wars Story, Deadpool 2 and Ocean’s 8. As the roaring edition will have particularly limited stock, keep an eye on Total Film’s Twitter feed for updates on its availability. It is only available in selected Sainsbury’s stores in the UK (unlike the regular Jurassic World special, which is in retailers nationwide). Happy hunting! Jurassic World: Fallen Kingdom hits UK cinemas on June 6, before opening in the US on June 22.